I had a revelation while watching Over The Top (1987) this weekend: Sylvester Stallone really is a good actor. In addition to his obvious bad assery, I found myself feeling bad for the big galoot as he struggled with dealing with his son. It shouldn’t really come as a surprise, I’ve seen a surprising amount of Stallone movies this pass year including Death Race 2000, First Blood, Rambo: First Blood Part II, Over The Top, Tango and Cash (how did I not blog about those three? ), Cliffhanger and Rambo. I’ve also seen most of the Rocky movies in my days, but need to rewatch them, Cop Land and, as I’ve mentioned before, I can’t wait for The Expendables. Two of those I’ve watched recently, so let’s jump in, shall we? A few weeks back I had some free time on the weekend (I came down with a crazy cold while we were trying to paint our bathroom, I swear) and decided to give Cliffhanger (1993) on Netflix Instant Watch. I got so into it that Em, who was graciously finishing the painting while I slowly turned into a snot machine, heard me yelling at the TV and was about to yell at me for playing video games while she was working until she came in to see me on the edge of my seat. I’d never seen the movie, so it held a lot of surprises for me, especially when it came to the cast. I pretty much only knew that Stallone and the girl from Northern Exposure (Janine Turner) were in it. I had no idea John Lithgow, Michael Rooker and the cop from CSI Miami (Rex Linn) were all in it. You gotta love Lithgow as a villain. The thing that surprised me about both of these Stallone movies is how much deeper the story is than you’d expect. With Cliffhanger, you’d just expect it to be dudes on a mountain making other dudes find their lost money, but instead you’ve got all this backstory between Stallone and Rooker and Stallone and Turner. The same goes for Over The Top, which I picked up at Best Buy for $5 last week even though I’d never seen it before. It’s not JUST the Stallone arm wrestling movie. He’s also dealing with his 10-year-old kid who he’s never met before (played by David Mendenhall, the voice of Daniel Witwicky in Transformers), the kid’s sick mom, her dad (played by Lost Highway’s Robert Loggia!) and a bunch of dudes in tank tops at the arm wrestling championship. Of course, it comes with its fair share of ridiculousness too. Stallone’s a truck driver and one of the prizes for the American arm wrestling championship just so happens to be a big rig. Exactly what he needs. Huh, go figure. There’s also a whole series of scenes in which his son steels a car, drive it to the airport, gives it to a security guard, flies to Las Vegas, avoids his grandpa’s goons (one of which, I’m pretty sure played a goon in Road House, the one with the curly hair) and makes his way to the arm wrestling championships all while his dad is in the middle of the competition. Crazy! How does he do this? Were credit cards even around back then? It’s like they tried to throw a little Home Alone in the middle of this action movie, it’s great. You’ve also got a great series of weirdos he has to arm wrestle (all of whom are much, MUCH bigger than him. If you can’t get behind this kind of awesomeness, I pity you. Two more quick things. One, the movie was so rad that it earned itself an action figure line back in 1986 with real arm wrestling action! I very much wish I could find a commercial online for this, but as the basic video search I did on YouTube brought nothing, click through to this Virtual Toy Chest link, you’ll be doing yourself a service my friend. 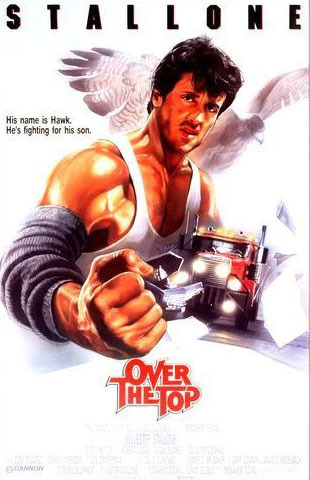 And second, just try and tell me that this painted image of Stallone, arm extended with a truck and a hawk behind him isn’t cooler than anything you’ve seen in the past 13 years. Bazinga!